Australians are being invited to be inventive with the McKenzies 12 blend soup mix. This is a combination of beans, lentils and barley. Joining the 12 blend soup mix is the Lentil Soup Mix. The lentil soup mix is a mixture of red split lentils, French style lentils, whole green lentils and yellow split lentils. Marketing Manager Bianca Piscopo said that the soup mixes are designed to make cooking easier. “We all know that pulses are a superfood ingredient and an excellent source of protein.” Piscopo said. 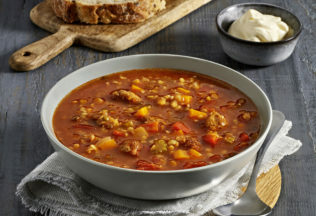 “Soup Mix and Italian Soup Mix have been part of McKenzie’s core range of soup offerings for decades and are still some of our most popular products. We envision that these new soup mix varieties will be an everyday pantry essential across Australia,” She said. Both soups are now available at Coles supermarkets and independent retailers with the recommended retail price of AUD $2.29.